Among the adorable first-day-of-school photos flooding parents’ Facebook feeds today is another set of images, ones so heartbreaking in contrast that they’re almost physically difficult to look at. But look, we must. 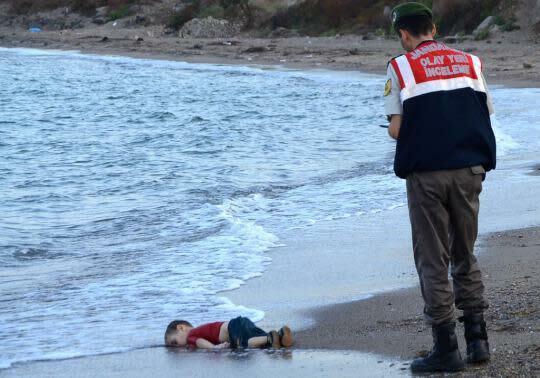 The photographs depict 3-year-old Aylan Kurdi, whose lifeless body washed ashore in Bodrum, Turkey, on Wednesday. Aylan drowned — along with his 5-year-old brother, Galip, and their mother, Rehan, 27 — when the Greece-bound boat in which their family was fleeing Turkey sank. Nine others in the group of refugees from warn-torn Syria, hoping to make a new life in the European Union and beyond, reportedly perished that day as well, not including the boys’ devastated father Abdullah. Images of dead children are, rightly, shocking to see on the front page of a newspaper, let alone popping up on social media amidst mundane musings about what your friends are considering to eat for lunch. And the arguments promptly put forth against sensationalizing the horror of these deaths by sharing the images aren’t entirely off base. (In the wake of the deaths, flippant memes created from the tragic photos have popped up online as well as video tributes). But human rights activists tell Yahoo Parenting that viewing these photographs, experiencing the upset that they trigger, and the haunting recollection of it afterward are important. Limón admits she’s frustrated that this tragedy is what it seems to take for people to pay attention to the humanitarian crisis — from which half of Syria’s population has either died or fled since the conflict began in 2011. “There was a 3-year-old who died in a truck recently while fleeing with his family, but we didn’t have the pictures, God forbid,” she says. The sight of Aylan laying doll-like on the beach, still in his T-shirt, shorts, and shoes is so powerful exactly because it’s heartbreaking. The image humanizes all the overwhelming statistics so easily glossed over. “Perhaps this is what it takes to have people wake up and realize that this is something we all need to respond to,” she says. “These people are human beings.” And they’re in trouble. The plight of Syrian refuges in particular, though, has gotten so horrific that the world needs to understand what this tragedy looks like, contend activists. 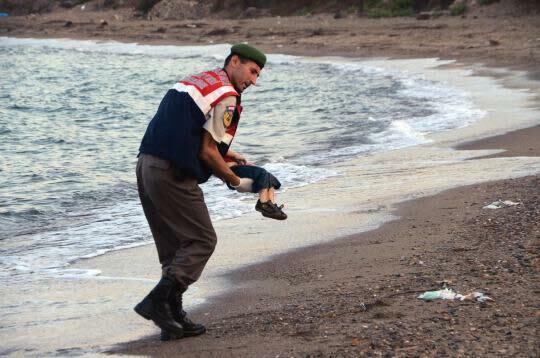 And, yes, the tragedy looks like the corpse of an innocent child. “This is a horrific image, but it is an image that we all need to see because we need to understand that our collective failure to stop the slaughter in Syria for the last four years and not welcome the people who flee its horrors are causing people to die and suffer tremendously,” declared Human Rights Watch’s emergency director, Peter Bouckaert, in an interview with Canada’s CBC. On Twitter he was even more direct. 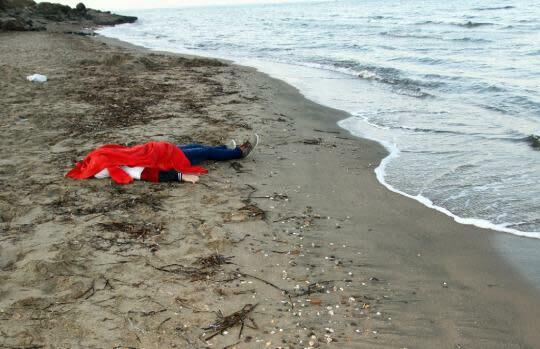 “Just pause 4 moment & imagine this was your child, drowned trying 2 flee #Syria war 4 safety of #EU #solidarity,” he wrote yesterday.